Even hardened soccer skeptics are being reluctantly drawn into the ballyhoo of World Cup 2014, whose first week provided a slew of exciting games, goals and dramatic climaxes, as well as fine performances by the Mexican and U.S. teams. Drug gangs are said be pleased as they assess the windfall President Enrique Peña Nieto has handed them by opening Mexico’s 75-year-old state oil company, Pemex, to foreign investors, putting up for grabs this country’s portion of the rich Eagle Ford Shale deposits. President Enrique Peña Nieto has announced that Pope Francis has accepted his invitation to visit Mexico on an as yet unspecified date. 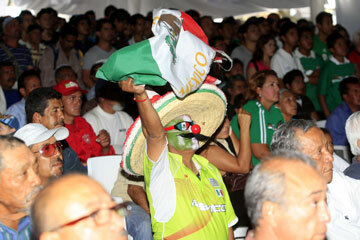 Mexican President Enrique Peña Nieto revealed his penchant for Mexico's famed fiery liquor during a visit to Guadalajara Monday. Mexico’s Secretaría de Desarrollo Social (Social Development Secretariat or Sedesol) is inviting Mexican citizens over the age of 65 who do not receive a pension to sign up to the new Programa Pensión para Adultos Mayores. Mexican and U.S. soccer fans suffered heartache this week after both teams made dignified exits from the 2014 World Cup round of 16. 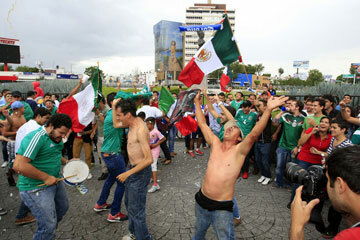 Around 5,000 delirious green-jerseyed, flag-waving fans made a beeline for Guadalajara’s Minerva traffic circle Monday afternoon after the Mexican soccer team advanced to the last 16 of the World Cup following a decisive 3-1 victory over Croatia.